Shanti Hostel is a very nice, small and cozy place located in just 3 minutes walking distance from the bus and train station and only 5 minutes from the center of our city Skopje. Designed with much love and care, Shanti is a hostel where the backpackers meet in small groups and share the experience in one of the oldest neighborhood in Skopje. We are a couple who own and run this nice and warm hostel and we've been travelling a lot, so we know very well what a backpacker needs during the traveling. In every room for each bed we provided a safety lockers, reading lights, electricity plugs, colorful curtains. 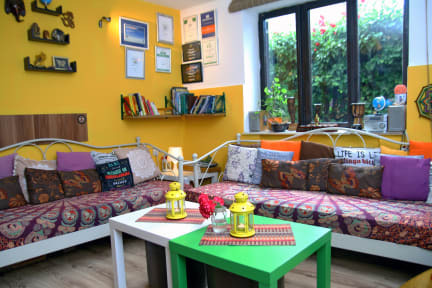 There is a beautiful and pleasant garden where you can relax and enjoy your moments in Shanti Hostel. Almost all the place is equipped with A/C and protected with camera security system. In the morning we serve a FREE BREAKFAST and there is FREE tea and coffee during your stay in the hostel. For our travellers we provide many activities such as airport,bus and train station pick up, horse riding tours, walking tours,thermal bath visits and many other interesting things. Near Shanti Hostel there are big super markets, restaurant, bars, clubs, theatre, swimming pool, shopping malls, change office and ATM . 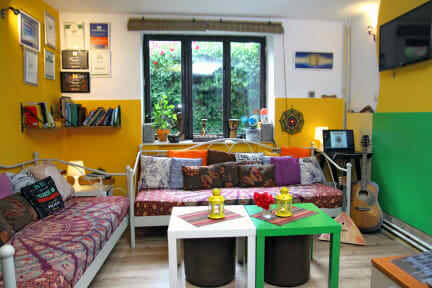 So we invite you to stay in our little and charming hostel and let us make your visit in Skopje unforgettable. Amazing hostel!! I really felt at home: super nice staff, clean, well decorated, warm... The breakfast is included and the common area is perfect to share with everyone. Thank you very much, one of the best hostel I have ever been ! This hostel is really great ! Good atmosphere, really clean and not far from the city center, I really loved it. For sure, I will come back one day there ! One of the nicest hostel I've ever been... honestly ! Extremely clean, free breakfast up to 12, well situated in town, strong wifi, nice facilities where you really feel at home ! Two places to hang out outside, and indside, great atmosphere between travelers, kitchen to cook or take coffee/tea whenever you want... Nothing missing ! Staff amazingly friendly and helpful, they might teach you how to prepare turkish coffee and share a drink with you. I ended up extending for 3 more nights !